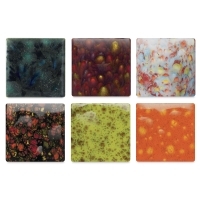 Jungle Gems consist of a base glaze with pebbles, granules, and specks of contrasting glaze that demonstrate "the magic of the kiln," as they bloom into bursts of color and specks during firing. Base glazes may be gloss or matte. Crystals may be the same type of glaze or a contrasting type. The mixture is designed to melt and smooth out in the firing. During firing, the crystals spread out and create dramatic effects. Glazes come in 1 pint (16 oz or 473 ml) bottles. They can be high-fired. Fire to shelf cone 06, or to shelf cone 05 if more flow is desired. Many of Mayco's Jungle Gems will fire to higher temperatures with excellent results (check Mayco's High Fire Guide). If firing to higher temperatures, allow a little extra room for the crystal's flow action. Three coats are required to produce the proper results. 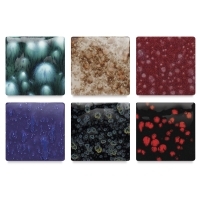 Jungle Gems that have a red glaze base require four coats of the base glaze. 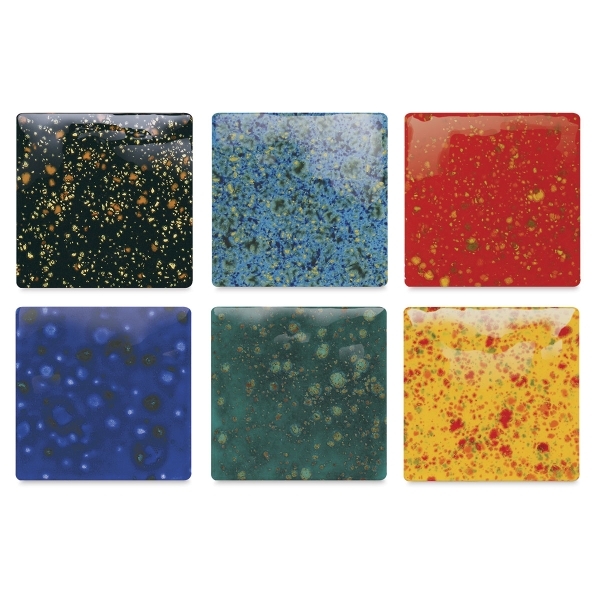 Whatever the base glaze, if enough glaze is not applied, crystals will not melt into the surface. Do not mix the crystals that have settled on the bottom of the jar into the rest of the glaze. Apply the first two coats in the usual manner with a soft fan brush. Mix the crystals into the remainder of the glaze and apply the last coat with crystals. A fan brush is helpful when applying the last coat for even dispersal of the crystals. Do not spray apply. Tip — When crystals are applied in a necklace effect around the top of the piece, they will cascade and flow downwards, creating dramatic effects. However, when applied too near the bottom of a piece, they tend to create unasthetic results. Caution — Jungle Gems Crystal Glazes are lead-free but not for use on food containers due to surface characteristics. Not dinnerware safe. Also, pay special attention to the safety precautions about handling glazes during application. Use good hygiene measures, such as washing your hands before and after you apply the glazes. Refrain from eating while applying the glaze. Class Pack #2 — This set of 6 pints includes Bloomin' Blue, Yadro Print, Strawberry Sundae, Royal Fantasy, Obsidian, and Black Opal. Class Pack #1 — This set of 6 pints includes Firecracker, Mystic Jade, Lagoon Blue, Sassy Orange, Blue Caprice, and Black Iris. Class Pack #3 — This set of 6 pints includes Wildfire, Kaleidescope, Pistachio, Blue Azure, Floral Fantasy, and Masquerade.